On All Fool’s Day 2013, this blog published the exposé — since cross-posted on globalresearch.ca — that G20 Governments All Agreed to Cyprus-Style Theft Of Bank Deposits In 2010. 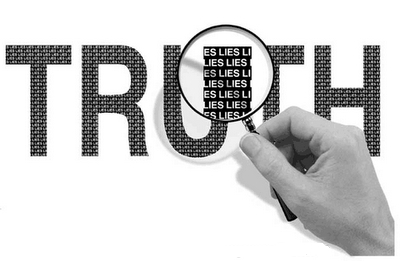 It is telling to observe how politicians (and the media) worldwide are using the deceitful art of sophistry to obscure this truth. As they all begin to pass the necessary legislation to enact what they have already agreed to — in secret, without providing clear and transparent advice to the public — they are seeking to subtly imply that these measures are needed as a result of what happened in Cyprus. When the truth is, little Cyprus was just the first test case for implementing the Goldman Sachs-headed internationalist Financial Stability Board’s new bank “bail-in” regime, agreed to by all G20 Prime Ministers and Presidents nearly 3 years ago. (Reuters) – A draft law that a group of European Union lawmakers voted for on Monday would shield small depositors from losing their savings in future bank rescues, but customers with more than 100,000 euros in savings when a bank failed could suffer losses. A group of lawmakers in the European Parliament’s economics committee overwhelmingly voted that, from 2016, large depositors in the EU might suffer losses if a bank gets into serious trouble. The plan was similar to a deal in Cyprus, where wealthy depositors at two banks took hits to save the country from bankruptcy. Under the EU proposal, a bank would dip into large deposits of over 100,000 euros once it had exhausted other avenues such as shareholders and bondholders. 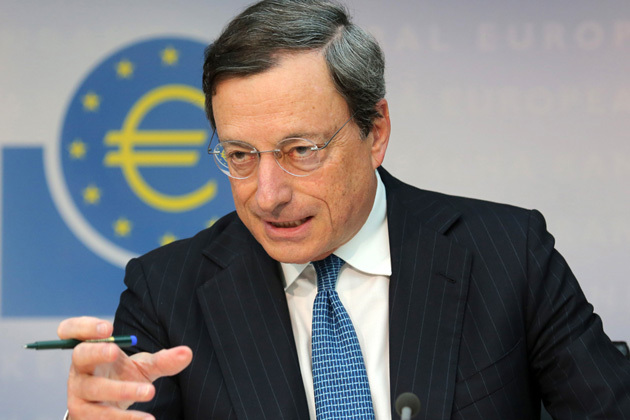 But deposits under 100,000 euros would be spared. “The case in Cyprus showed how important it is to have clear procedures for making shareholders, bondholders and ultimately depositors foot the bill,” a press release from the committee said after the vote. See what I mean? The Cyprus “bail-in” test case, deceitfully used as an example of why governments supposedly need to pass legislation for “similar” actions in their own countries … legislation that they already agreed to pass anyway, nearly 3 years ago. EU finance ministers agreed last week that large, uninsured depositors should be subject to losses but some countries may still seek some flexibility on how they wind down their banks. 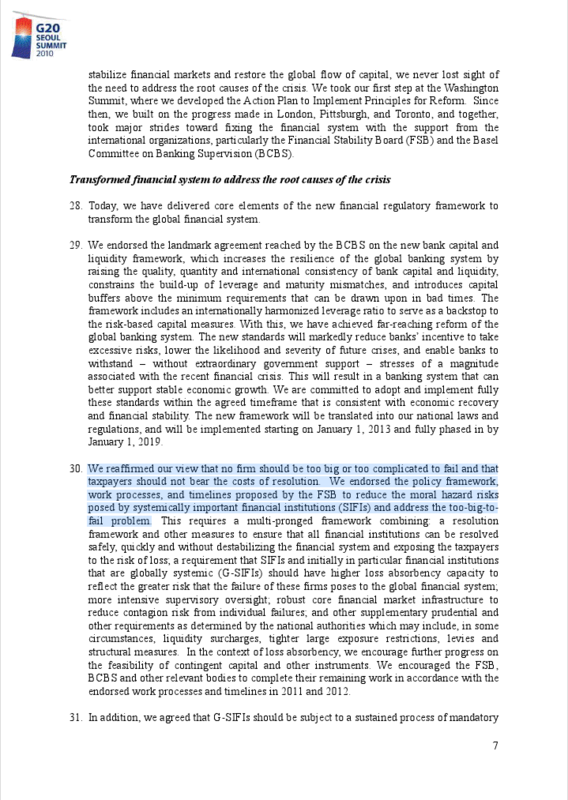 The “finance ministers” agreed, “last week”? 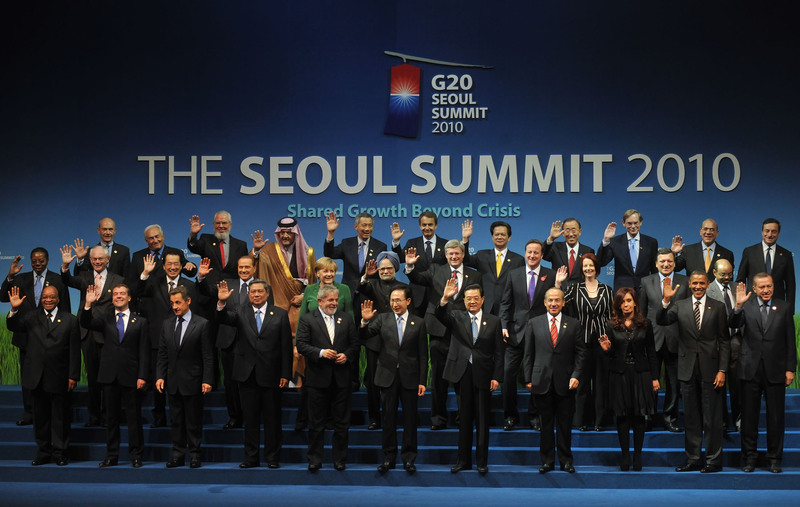 As shown previously, the Prime Ministers and Presidents of the G20 nations all agreed to the policy framework laid down by the Financial Stability Board (FSB) at the Seoul G20 Summit, way back in 2010. There is something else that is very important to note. 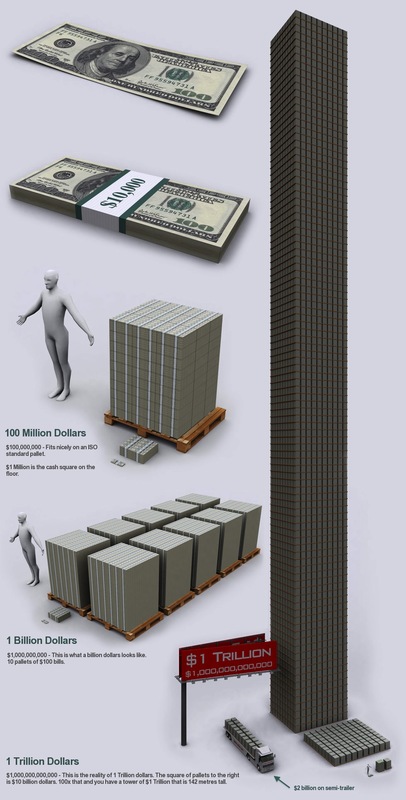 The FSB, politicians, bankers, and bureaucrats all want you to believe that these new procedures might only place at some risk the savings of so-called “large” or “big” depositors. 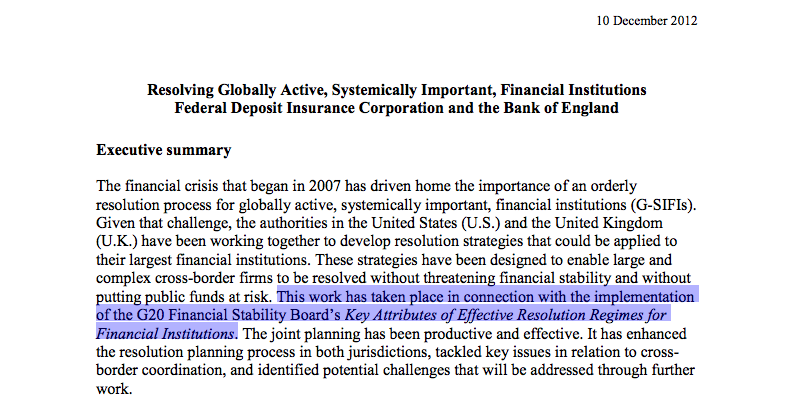 In other words, whether you have more than (say) 100,000 Euro/Dollars/Pounds deposited in a bank, or less, it is recommended (by Goldman Sachs’ FSB) that G20 governments legislate powers enabling their “resolution authorities” the “flexibility” to treat you any way they see fit. “Equal treatment” is only a “general principle” to these people. 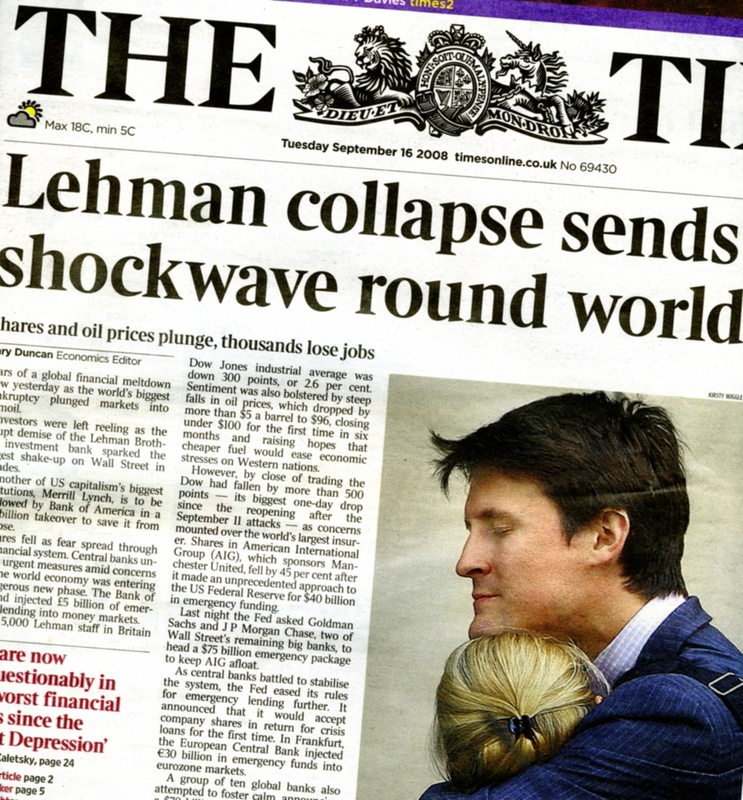 You may be wondering, if G20 governments all agreed to this way back in 2010, then why are we only now seeing nations from Canada to Europe beginning to draft and pass bank “bail-in” legislation, behind a smokescreen of lies and deceit? 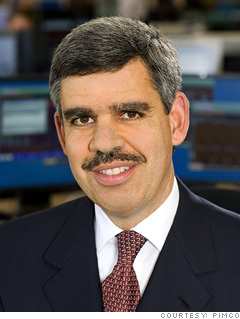 If The CIO Of The World’s Biggest Bond Fund Doesn’t Trust The Global Banking System, Why Do You? 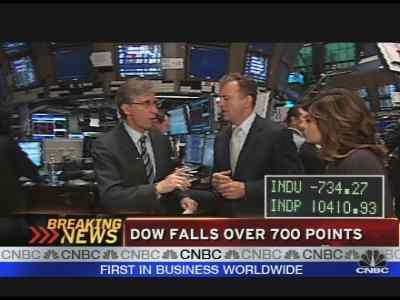 The firm had been preparing for catastrophe for a long time, but even so, there was a sense of apprehension because things were accelerating very, very quickly. With a “new international standard”. One cannot help but laugh at the Orwellian doublespeak slogans used by the architects of this new regime. 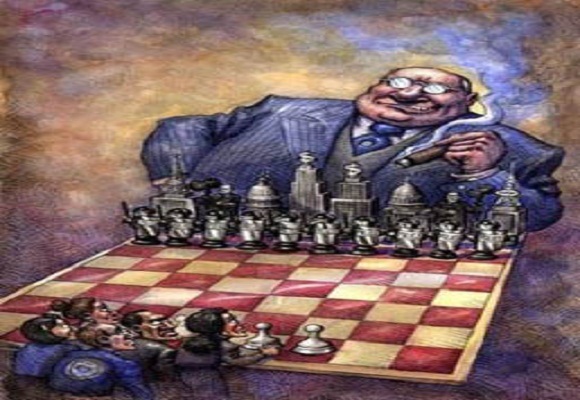 To address the problem of “systemically important” banks, “without exposing the taxpayer to the risk of loss,” our puppet politicians have agreed to confiscate … the savings of taxpayers. Yes, today is All Fools’ Day. And no, you can’t make this $h!t up. 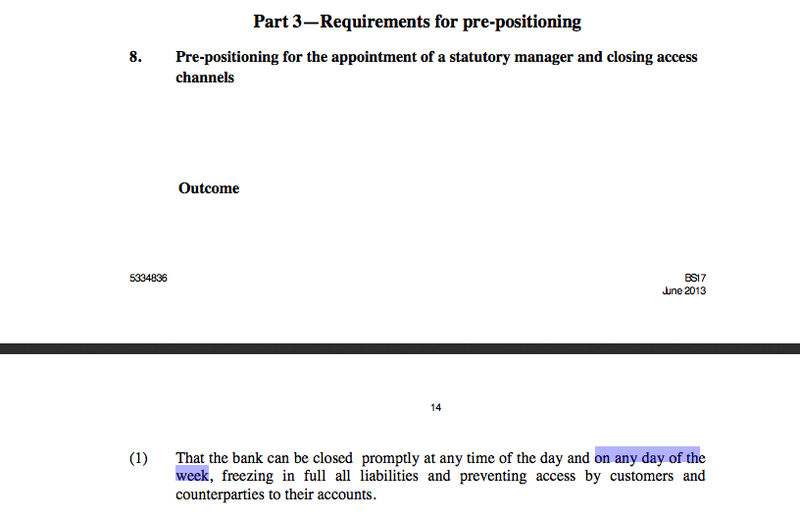 You may be thinking that this excerpt from an FSB press release does not prove that the G20 have specifically agreed to confiscation of bank deposits. And you would be correct. As with all such schemes, it is not intended that the public will easily discover what has been planned. 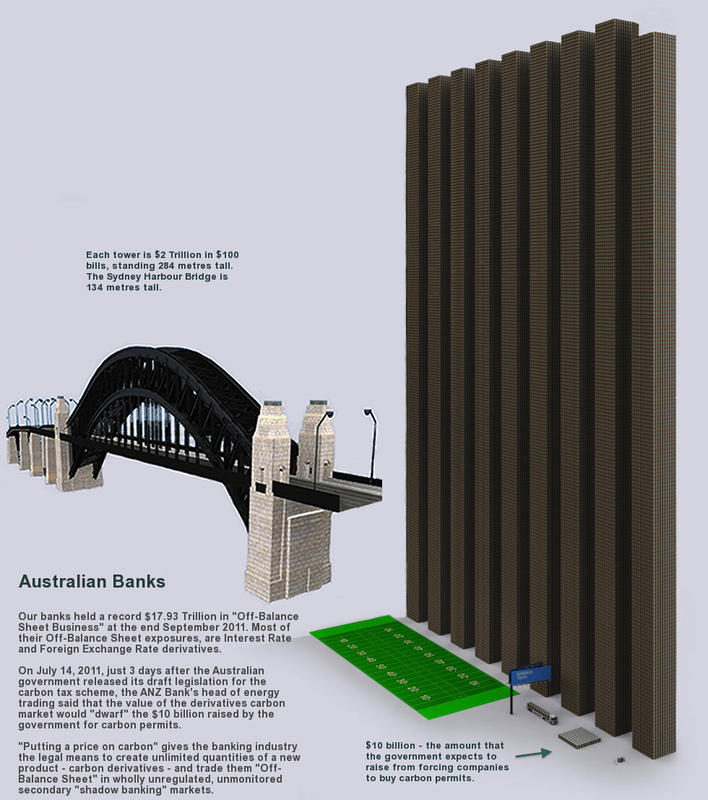 You have to wade carefully through all the verbose (and deliberately obtuse) technocrat-ese, and cross-reference the supporting documents (and their annexes), in order to discover just what our G20 attendee politicians – geniuses like “World’s Greatest Treasurer” Wayne Swan – have actually signed up to. And to find the smoking gun. One with the word B A I L – I N stamped clearly on its barrel. 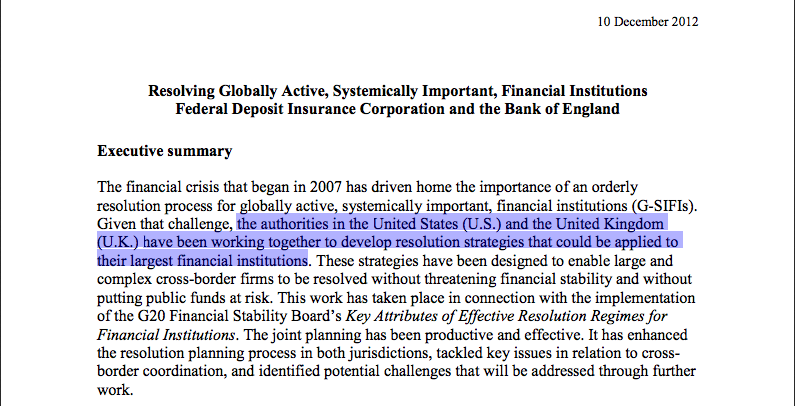 That framework is set out in the FSB’s “Key Attributes of Effective Resolution Regimes for Financial Institutions” (pdf). 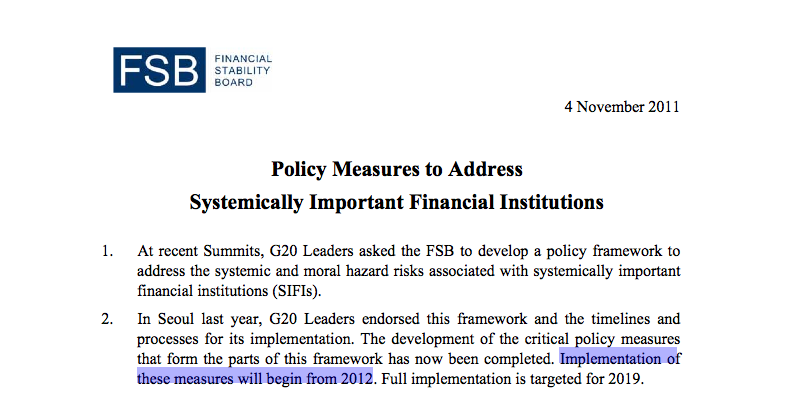 Now if you are still sceptical that all this means the G20 have specifically agreed to a new regime that might include provisions for a Cyprus-style “bail-in” using depositors’ savings, then perhaps it is because you – like me – would be looking for this exact phrase in order to be fully convinced. 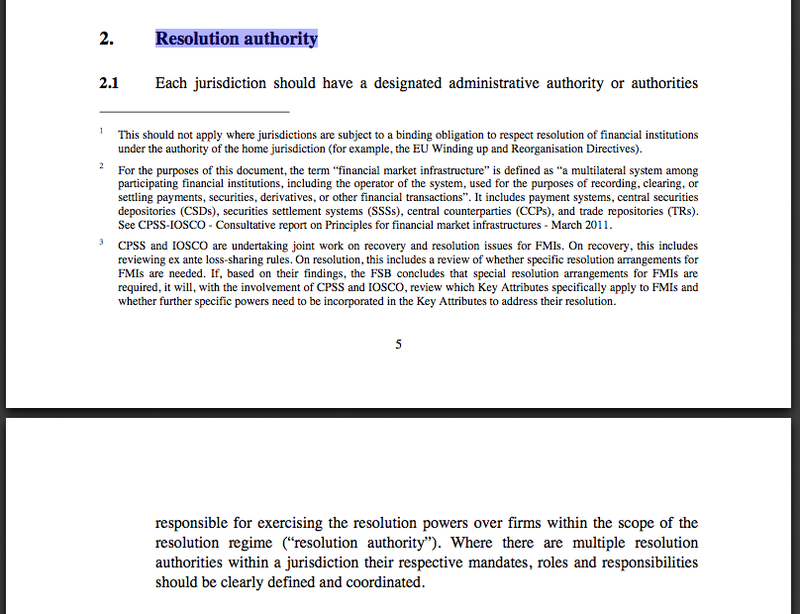 Note that not only can the Resolution authority use a “bail-in” to support “continuity of essential functions” of a failing bank; it can also do so in order to finance the setting up of a new third party or “bridge” institution, into which the failed (“non-viable”) bank’s assets or liabilities (ie, your savings) can be transferred. Not so you can get your money back, but for the purpose of “capitalising” the new institution. Moral relativism at its finest. 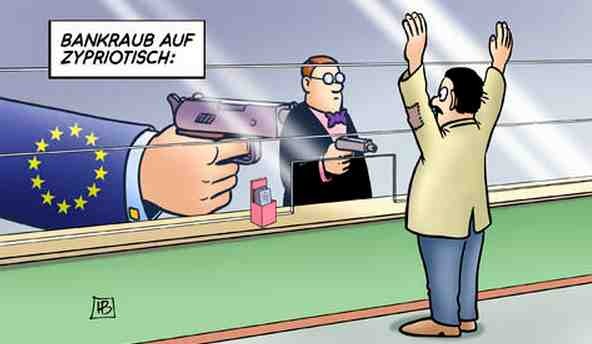 This is what has happened in Cyprus. While the final details are still evolving as to exactly how much Cypriot depositors holding more, or less, than €100k will have stolen from them, what is clear is that this FSB template for bail-ins in G20 nations or “jurisdictions” (EU), is the one being followed. What is also clear, especially in light of recent revelations that Canada has expressly identified “bail-in” procedures in their 2013 Budget, is that all Western governments have, unbeknown to their citizens and without their consent, agreed to the imposition of the same new regime for managing insolvent banks. 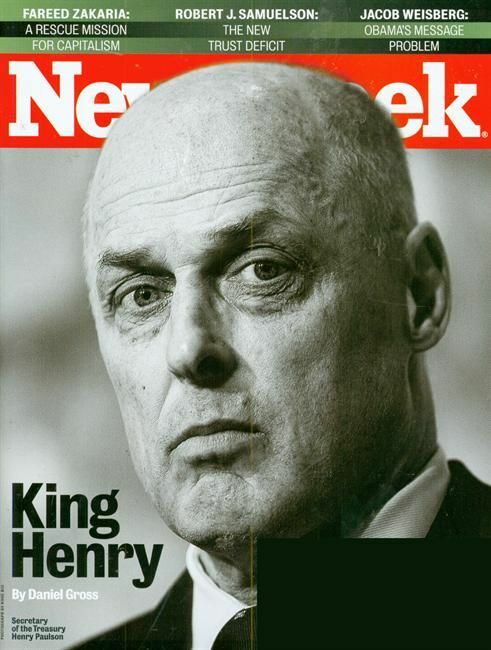 A regime devised, and dictated by, an unelected central body. 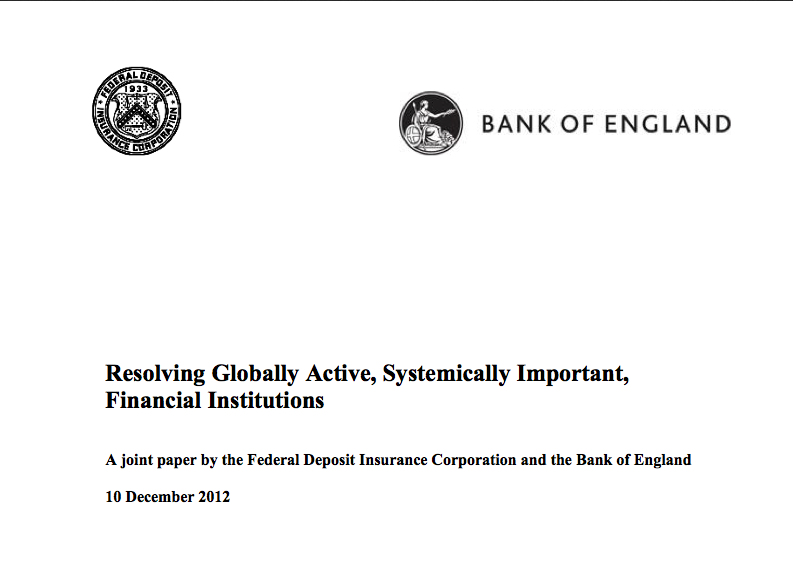 Feel free to check these documents for yourself, here (pdf) and here (pdf). 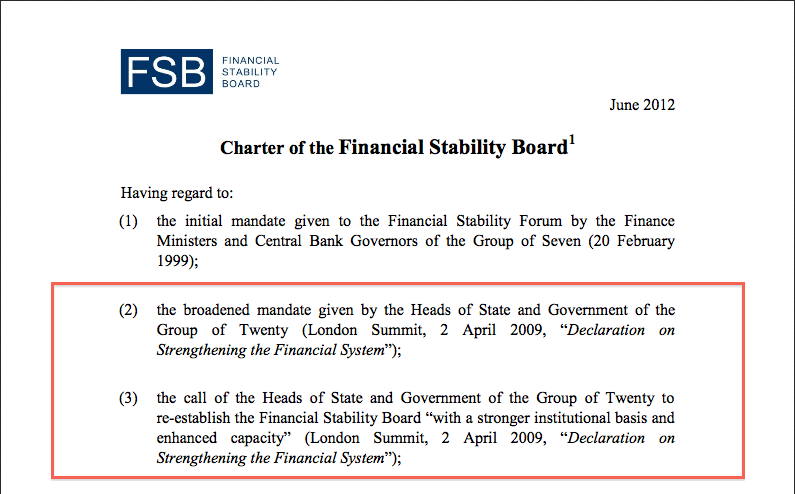 Are you wondering who and what is the Financial Stability Board? The FSB has been established to coordinate at the international level the work of national financial authorities and international standard setting bodies and to develop and promote the implementation of effective regulatory, supervisory and other financial sector policies. It brings together national authorities responsible for financial stability in significant international financial centres, international financial institutions, sector-specific international groupings of regulators and supervisors, and committees of central bank experts. A list of institutions represented on the FSB can be found here . A kind of “super regulator”. Chaired currently by a Goldman Sachs man. 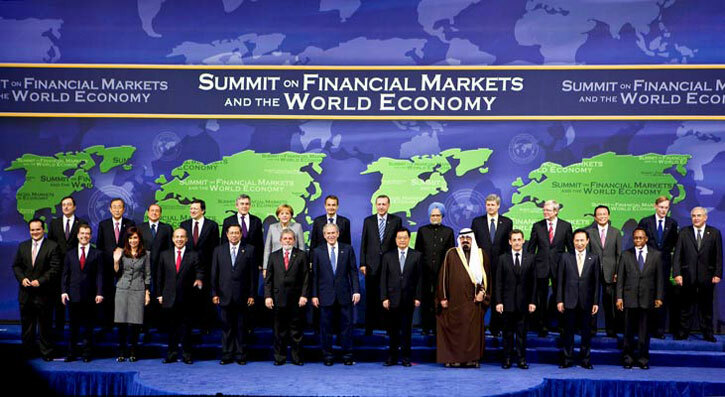 With membership comprising the central bankers, treasury department heads, and prudential regulators of 24 nations, along with the IMF, World Bank, and a cavalcade of others. 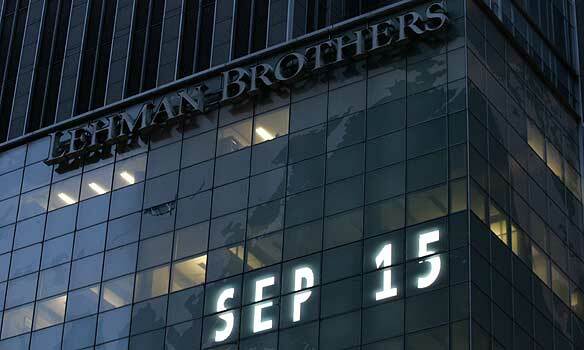 Including – and “hosted by” – the central bank of central banks. 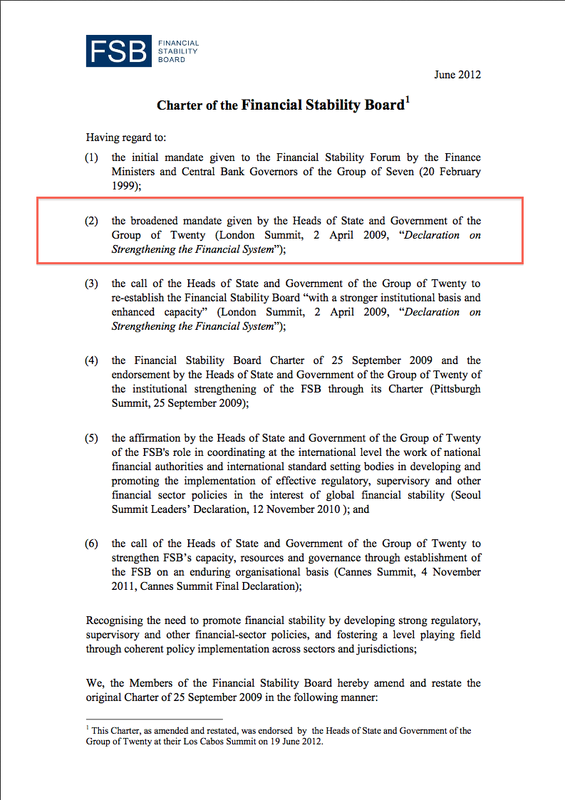 According to its updated Charter (pdf), the FSB received its original mandate from the central bankers and Finance Ministers of the G7 nations in 1999. So… the hapless G20 heads of government, panicking in the midst of the GFC, gave the fonts of central banking wisdom at the FSB a “broadened mandate”, and “asked” them “to develop a policy framework to address the systemic and and moral hazard risks associated with systemically important financial institutions”, did they? 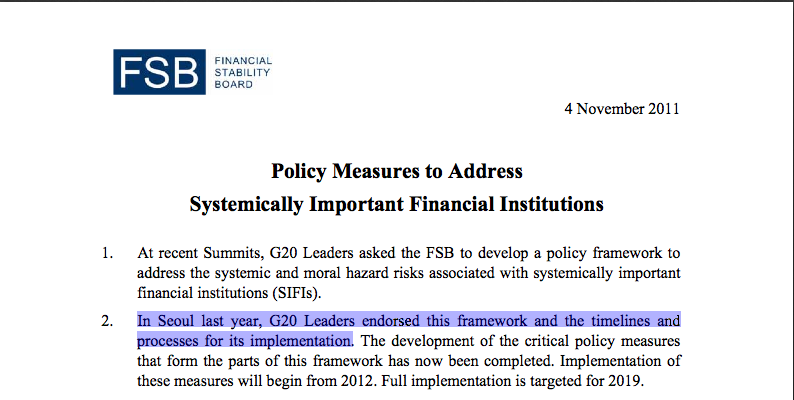 And under the consecutive chairmanships of Goldman Sachs men, these unelected bankers and bureaucrats – not one of whom warned of the approaching GFC – devised this “bail-in” policy for the whole of the G20, to solve the problem of Too-Big-To-Fail banks?